For use with XBLUE QB, Cloud Burst systems or other open IP systems such as Broadsoft & Asterisk*. 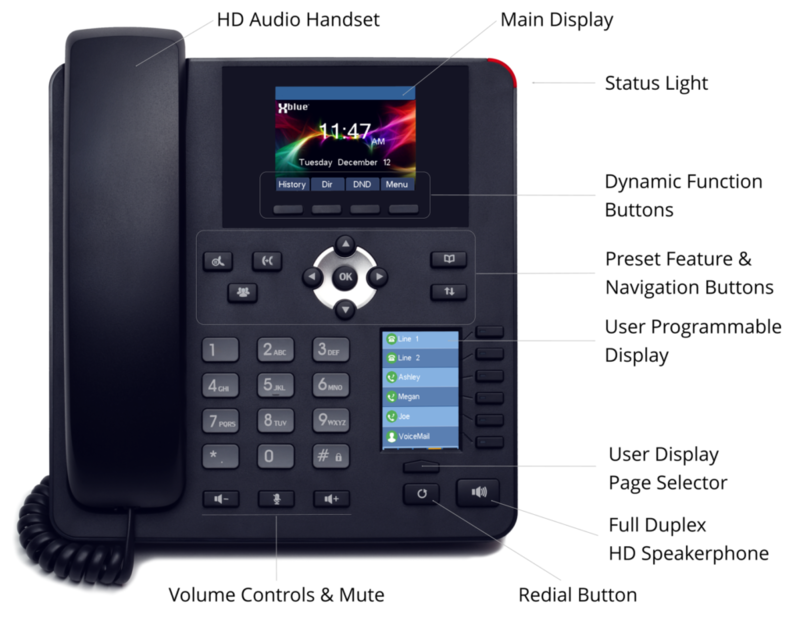 The IP7g is an enterprise-grade IP phone that seamlessly integrates with a wide variety of VoIP cloud and onsite phone systems including Broadsoft, Asterisk and XBLUE QB series VoIP Platforms. The Main Display shows call details, call logs and other active call related information. The Main Display has 4 dynamic buttons that change function based on call status making it very easy and efficient to select functions that are relevant during call progress. The 4 Main Display buttons are customizable for your particular needs. The User Programmable Display has 6 Buttons with Multi-Color LEDs that show the status of up to 30 system users. The buttons are arranged in 5 quick access pages that are selectable with one touch of the page selector button located below the display. These buttons can also be used for access to system features or speed dialing. The phone’s Dual Port Gigabit Data Switch optimizes workstation cabling without compromising network speed. The IP7g is fully Power Over Ethernet (POE) compatible and includes Plug-In AC Power Supply for applications without POE. Each IP7g also comes with an Ethernet cable and an adjustable stand that enables multiple viewing angles and wall mounting. The IP7g uses the most current HD VoIP audio technology to enable clear, high quality audio. For hands-free operation use the Full Duplex HD Speakerphone, or use the Electronic Hook Switch Control for optimized Headset Operation. 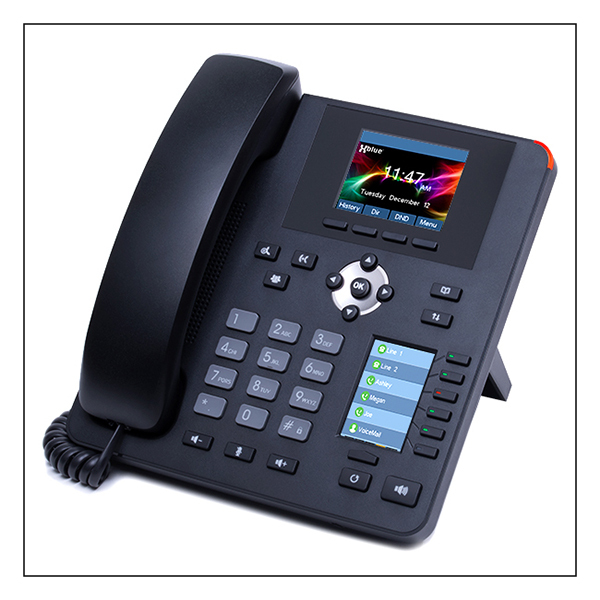 The IP7g supports up to 4 SIP Lines / Account Registrations and is provisionable for use with both Cloud and Onsite VoIP Systems such as Broadsoft, Asterisk and many other SIP VoIP platforms. Security supported with SRTP (Secure Real-time Transport Protocol) and other security and encryption methods. The Call Log lists up to 600 calls including missed calls, received calls and dialed numbers. The Redial Button displays the list of recently dialed numbers for quick and easy recall. And calling can be further automated with up to 500 speed dial contact phonebook with support for standardized LDAP ( Lightweight Directory Access Protocol) and XML (Extensible Markup Language). All of the most commonly used features are pre-programmed on the phone with one-touch, preset Feature Buttons for easy and quick operation including Hold, Transfer, Conference, Volume Adjustment, Mute, Redial, Phonebook and Call Logs. The High Visibility Status Light in the upper right corner of the phone shows busy, ringing and voicemail indication making it possible for others in the office environment to see the current status of the phone when entering the user’s work area. Call us toll free at (866) 925-8312 or send us a message via our website. Our US based technical support staff is ready to assist! So please call us with any questions you might have regarding the purchase of an XBLUE phone system or any time after your purchase for real time personal assistance.